I have been reflecting not only on the past 35 years of our marriage, but also of the wedding and the festivities around it. My beautiful wedding dress appeared on the cover of Bride Magazine that summer of 1975 and I purchased it at a well renowned store in Dallas who offered the service of storing the dress and delivering it to both the bridal portrait session and the wedding so we did not have to worry about where to hang it, cart it around, etc. Bad idea!! The Dallas Morning News’ article was entitled, “Bride Bared by Breeze”. This highly reputable store accidently delivered my size 4 (yes, I used to be little) wedding dress to the wedding location of a size 12 bride instead of to where I was to get my wedding portrait done!!! The article went on to say that the mistake was discovered too late for the bride to do anything but to wear the dress. She was able to get it on….but she was not able to zip it up. No worries though because her veil covered up what the dress did not. That is….until….as she walked down the aisle, the Dallas summer weather stirred up a breeze which “bared” the bride! It is hard for me to imagine how that bride must have felt, but….you know….if you and I are not careful, we will try to fit into someone else’s mold or expectations or even someone we want to be…and it just does not fit!! You know scripture teaches that we have been created by the Potter for His purposes…why in the world do we want to squeeze into something that never was intended to fit us? Stop doing or being what you know God did not design you to do or be!! Be You and Love It! Thirty five years ago this month I walked down the aisle and married the man of my dreams!! I had no idea what I was getting in to….all I knew was that I loved this Godly, silly man and wanted to spend the rest of my life with him. I wish I had a picture from that day to show you....they are all boxed up waiting for us to sell our house and move our stuff....so instead I am putting this silly picture Lana Rose took at the Secretaries Conference!! Certainly I did not know he would one day be a pastor….which would mean one day I would be a pastor’s wife!! If that were the case…..I am pretty I would have had to think twice about marrying him!!! You see, I did not know any pastor’s wives at that time….I had never gone to church growing up and I did not know the wife of the pastor at the church I was going to. But what little I did know….I knew there would be NO way I’d ever be a pastor’s wife!! Never! Ernie told me about five or six years into our marriage that he thought God was calling him to pastor….which would make me a pastor's wife!! I had major conversations with God telling Him He could NOT let this happen!!! By that time I actually knew two pastor’s wives….but I was nothing like either one of them!! Nothing! There was NO way I could be them! I will never forget how God sweetly came to me and said, “Dana, I am not asking you to be like them….I am asking you to be you!” Oh, how freeing that was!! All God was asking me to be is me??? I don’t know if you are struggling with the “role” of being the pastor’s wife….or if you are fulfilling a dream you have had ever since you were a little girl, but let me tell you my friend….all God is asking is that you be you!! Not be like the other staff wives or other pastor's wives you know. Be you and love it!! Well, I officially had a power shortage this week. Like many ministers wives, my proverbial wagon was overholded. Since school has started I have subbed everyday but two. However, on those two days, which were this week, I spent my days in a flurry of chores-housecleaning, laundry, grocery, errands. (I also believe part of my problem is that I am trying to reduce my chocolate intake. Well, I'm just saying). It was not until today that I glanced at my calendar and realized it was my week to blog. I felt like Isaiah who cried, "Woe is me for I am undone!" I think life happens to all of us at times. We get so wrapped up in the little things of life that we fail to slow down and recharge. To say that I felt terrible for missing my week of blog is an understatement. I love this "job" because it allows me to fulfill a burden God has placed on my heart which is to encourage other ministers wives. However, I confess the rush-rush of the past two weeks caused me to not only fail you but the Lord. One thing I have learned as a Christian is that God is a gracious and loving Father. When we fail or disappoint Him, we only have to come before the throne. Isn't that an amazing thing! When we confess our shortcomings to the Father, He recharges us and gives us the power and strength to continue on life's journey. The Bible speaks of the power of God in Ephesians 1:20 which says, "He demonstrated (the power) in the Messiah by raising Him from the dead and seating Him at His right hand in the heavens" Ladies, I firmly believe in a God who raised His Son from the dead and I firmly believe God can recharge our dead batteries as well. One a personal note: I ask that you pray for a fellow minister's wife family whose son was recently injuried in the war. Praise God, his injuries are not life threatening. Please pray for all our service men and women as they protect us. Pray that God will protect them and recharge them when they are discouraged or tired. Ladies, September 1st is the early bird deadline to register online for our Ministers Wives Retreat, October 1-2 at CarsonSprings Conference Center in Newport. Early bird cost is $65 for double occupancy. You can find all the information at www.tnministerswives.org. A brochure is included with online registration instructions. We have a wonderful program planned just for you. 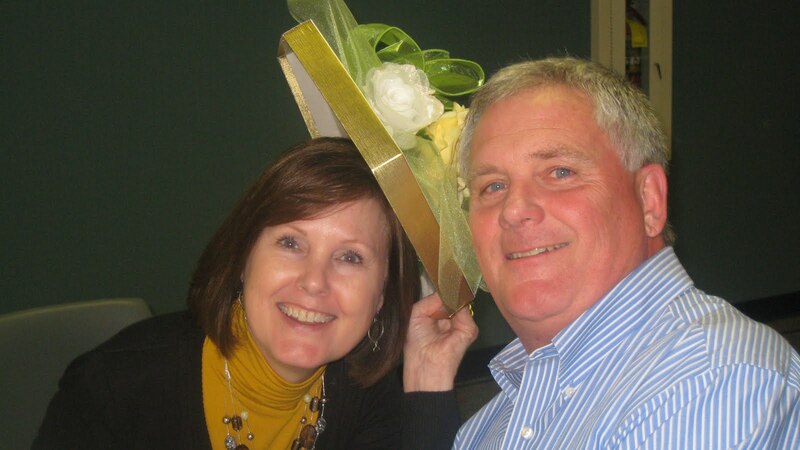 This will give you a great chance to meet Jeanne Davis our new Executive Director's wife. Come join me and other ministers wives in Newport, October 1-2. See you soon. Isn't that an intriguing title? I saw it on some sermon notes from one of my son's church. It really made me think about the way we talk to God. I know you are a minister's wife and your job is to pray! (at least that is what a sweet lady in my church told me one day) Yet, I wonder if sometimes we forget that we are talking to Someone who loves us very much, Someone who gave us Who He loved most just to have a relationship with us. The following are a few points of the sermon that caught my attention. Read Matthew 6:9-15 to see what transformed prayer looks like. 1. Pray in Relationship - Our view of God affects our relationship. Yes, I am going to leave it to you to look up the scripture and ask God to show you how to have a more powerful prayer life. It will be worth your time to take time and study a little about prayer. Have you ever felt like God was not listening, hearing, or answering? If you have been one of His children very long, you have had times that you felt He was silent.I heard several quotes this past Sunday that reminded me of the faithfulness of our God. The first quote was, "When God is silent, He is still at work." In Hebrews 13:5 we are told, "I will never leave you or forsake you." Those are not just words, but a promise from the Living God. Whatever situation you are in at the moment, He is walking through it with you. You can count on it, whether you are hearing Him or not. The next quote was, When you cannot see His Hand, trust His Heart. I realize these are not new thoughts, but they were great reminders and encouraged me. We do not always understand the plan, but we can always trust in our God. His plan is perfect. Jeremiah 29:11 "For I know the thoughts (PLANS) that I think toward you, says the Lord, thoughts (PLANS) of peace and not of evil, to give you a future and a hope." In ministry, we can feel alone and defeated. God assures us that we are not forgotten and His plan is in place. He continues in Jeremiah to tell us what to do in these silent times. Jeremiah 29:-14 "Then you will call upon Me and go and pray to Me, and I will listen to you. And you will seek Me and find Me when you search for Me with all your heart. I will be found by you, says the Lord, and I will bring you back from your captivity." Is God silent for you, today? Take time to seek Him, He is there always! I have been preparing for an upcoming event for minister’s wives that I want to share with you. On August 26-27 there will be an event just for wives of ministers. It is in Richmond, Virginia and has been developed just for you. There will be six minister’s wives speaking on everything you ever wanted to know about being a minister’s wife. Besides myself you will have the opportunity to hear, Becky Badry, Rachel Lovingood, Leighann McCoy, Jennifer Landrith and Sherry Lee. I will be speaking on God’s Call, Forgiveness and Making Sunday’s Special. The other women will be addressing marriage, children, friendships, ministry, dealing with difficult people and more. The best part will be Beth Moore who is coming to share, laugh, cry and spend time with you. She will be sharing messages she has received from the Lord for each woman whom God brings. I hope you will be able to come to this event. It will be a time to meet other wives and share. It will be a time to be prayed over, loved and listened to. If you are interested in this event, go to Lifeway’s website www.Lifeway.com/women and look for Called, Equipped and Encouraged. I hope I will see you there. Come up and introduce yourself to me! I have the wonderful privilege of keeping my 9 month old grandson, Luke Douglas three days a week. I am really enjoying my time with him and realizing why God gave me children when I was young! Luke is crawling, pulling up and trying to move a little bit around furniture while holding on. He keeps me very busy. He does not stay in the same place for very long. When Luke pulls up on furniture I am always right beside him. He doesn't seem to be aware of me as he is reaching for something new. He leans a little too far and I push him back up, his balance is lost and I set him safely on both feet, he reaches for something breakable and I move it out of reach. Luke is so busy pulling and reaching that at times he is totally unaware of my presence. As I thought of how independent he thinks he is, yet has me walking every step with him, I could not help but think about how often God must see me doing the same thing. Each day I am pulling and reaching in one direction or another. It is so easy to get wrapped up in what I am reaching for that I don't see God's Hand guiding me. Every once in a while Luke will stop and turn to look for me. He will lower himself to his knees and crawl as fast as he can up into my lap. Then the very best thing happens, he pulls up and throws his arms around me and hugs and gives soggy kisses! My heart melts and I am filled with love and joy. As we go through our days, don't you think our Father would love to see us hurrying to Him just to love Him. No requests, no problems, just "I love you, Father." He is there guiding every step, balancing you when you are shaky, keeping you safe from the things that could hurt you. Take time to love Him today. I John 4:19 " We love Him because He first loved us." In my blonde reasoning brain Diet Coke balances the chocolate chip cookies in my diet. It simply eliminates the caloric intake and removes some of the guilt of eating more than one cookie. I did not say it was true but this type of reasoning works just fine for this chocoholic. In our ministry families we often bring different spiritual gifts that are perfectly balanced into our homes and churches. For instances, Ricky, my husband, possesses the spiritual gifts of prophesy and leadership. There is very little mercy or helps in his profile. I, on the other hand, score highest in service, giving, and mercy. Now you throw our two sons into the mix and the dynamics change. Our eldest son also has the gifts of prophesy and leadership while the other son is strongest in exhortation. While two people are discussing the issue at hand, the other is providing the encouragement. Meanwhile, I serve the drinks and snacks. We are so totally opposite that sometimes our home is just funny, however, God gave each of us our spiritual gift to balance the others gift. Just like in our families, our churches are full of people with spiritual gifts that compliment each other. God has uniquely placed individuals within our church to help further His Kingdom. While some have the gift of prophesy, others balance it with mercy or compassion. Those people with the gift of administration can direct the servants. The individuals with the gift of exhortation can put their arms around people who need encouragement. Now, it is true that the Diet Coke/chocolate chip cookie balance may be thinking outside the box. However, God intends for us to have balance in our lives. Providing the perfect balance of spiritual gifts to believers whether it is in the home or church is just one more of God’s perfect plans. There are times when I meet a woman and immediately I know I want to invite her to my next chocolate overdose. For me, this lady will be a Christian servant, humble, a little daring, a little scatterbrained, funny, and like me, feel that God has a great sense of humor because of how He puts things in our lives. About three years ago I was introduced to Jeanne Davis, one of my fellow bloggers. At the time she and her husband, Randy, served at Sevierville First Baptist. During that short meeting I immediately knew I liked her. Through her blog times I discovered that she has a lot of qualities I like to have in my friends. Like me, Jeanne has served alongside her husband for over 30 years and will admit she is still in the learning mode. One thing I love about her is that she has a heart for other ministers wives. At a recent meeting Jeanne stated, “If the wife is not happy, the husband’s ministry will not be as affective.” She understands that women married to ministers are in the trenches together experiencing the same struggles and joys. Currently Jeanne is in a transition role. Her husband, Randy, is now the Executive Director for the Tennessee Baptist Convention. Not only is she assisting her husband in discovering how God is directing his new ministry at the state level, but Jeanne is seeking God’s guidance for her new role. As I listened to my sweet friend share her heart the other day at our team meeting, I walked away feeling quite confident that Jeanne’s passion for ministers wives has expanded. I cannot wait to see how God is going to use this lady in the life of Tennessee Baptist. So ladies, I want to encourage you to get to know the Davis’ especially Jeanne. You will find her to be a funny, sweet, zany, humble servant of God. If you get to come to the state convention in November, stop by the Ministers Wives Fellowship booth and meet Jeanne. You can tell her I sent you to get your Bible signed by her. Ask her if she is available to speak at your ladies event too. Oh, but before you inquire, make sure she is able to locate her Daytimer. There is a story behind the autograph and the Daytimer but I will let her tell you about them. Oh and Jeanne, I love you my sweet girlfriend! So many of my own frustrations, stresses, disappointments, and even sins can be effectively avoided if all I did was have a "Perspective Check." This goes back to the whole glass half full/empty analogy. If we take the time to step back and really look at our situation from God's perspective, how many negative thoughts, feelings and words would we avoid? I am just wrapping up a study on the book of Ruth. You are familiar with the story and know how God took Naomi from hurt and bitter to healed and better, much better. Even in the end when she held Obed on her lap, she had no idea just how much better God had blessed her. She had no way of knowing that through her pain and misery that God was orchestrating the circumstances to produce Israel's greatest king and then ultimately the Messiah. Ladies, be encouraged. Whatever you are facing, God has a purpose behind it. Claim the promises that you know exist in His word and ask Him to give you His perspective on your specific situation. Feeling down? Check your perspective and ask God for His insight. I am sure if you are reading this anywhere in the south you know that it is truly hot outside. I was out this morning at 7:00 and the temperature on the bank clock was already reading 80. When I drove back by less than an hour later it was 85. Once home, I water my parched flowers only to find them parched again by noon. Soooooooo . . . . no spiritual application here today, just looking for some new ideas/ways to beat this heat. What are you doing to stay cool? Or maybe you have a great recipe for an icy drink that you could share. I am sure Vickie you have something involving chocolate! We were blessed to spend last week with good friends from a former church in the mountains of Pigeon Forge. The "Smoke" Mountains, as my eldest used to call them, continue to hold a special place in my heart as they majestically and awe-fully point me to worship their Creator. After spending a week purposefully not wearing my watch, I truly felt as though I was dropped into the deep end of reality yesterday morning as I awoke to take on a new day and new week of responsibilities. Things are happening at the church. Things are happening at my daughter's school. Things need to have been done. Things are waiting to be done. Ever feel like you are about to be overwhelmed by all those kinds of things? BUT! I know I have so much to be thankful for. My reality includes an un-mowed lawn, not an undone life. Thankfully, my girls are healthy. My loved ones are safe and not in harm's way. My friends are close and I have an incredible husband who unpacked all the bags and put them away- without me asking! My reality is a good one. Yes, I am busy, but it is a good busy. I know I am where I am supposed to be. I am content here in my deep end. Thank You God for the perspective you give, the peace you offer and the power to do the things You have asked me to do.